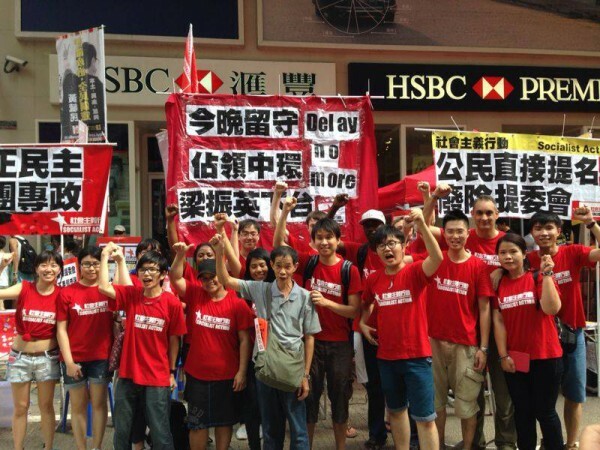 Chinaworker.info – Hong Kong: What next after massive July 1 demo? Hong Kong: What next after massive July 1 demo? 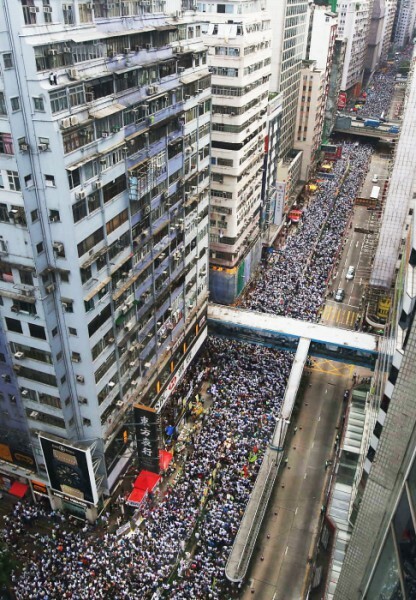 This year’s ‘7.1’ (July 1) anti-government demonstration in Hong Kong was massive, one of the biggest protests in East Asia in the past decade. Demo organisers put the attendance at over 500,000, similar to the turnout in 2003 – a revolt against repressive national security legislation (‘Article 23’), which gave birth to ‘7.1’ as a day of anti-government protest. Many participants believe the turnout was even bigger, perhaps 700,000. With the march starting at 3.00pm, it was 11.00pm by the time the last ranks had reached the finishing point. A promise, after years of obstruction, to allow Hong Kong’s Chief Executive to be chosen through one-person-one-vote elections (universal suffrage) in 2017, has now been exposed as just another CCP trick – as Socialist Action (CWI in Hong Kong) predicted. Beijing is insisting on a nomination committee enabling it to screen out candidates and thereby control the election outcome. The current political crisis follows decades of broken promises, firstly under the British and then for the past 17 years under the Chinese dictatorship, which has lied, manoeuvred, and sown false trails in order to face down demands for free elections. Part of the 510,000-strong July 1, 2014, demonstration. As the struggle now enters a crucial phase, with the Hong Kong government presenting its (i.e. Beijing’s) model for the 2017 elections before the end of this year, the CCP’s propaganda war against the democracy movement has reached a new intensity. The ‘moderate’ bourgeois leaders of the pro-democracy parties (pan democrats) and the Occupy Central movement, who in reality are desperate to avoid an all-out struggle, are portrayed by Beijing as agents or stooges of more ‘extreme’ pro-democracy groups and ‘foreign anti-China’ forces. Recent speeches and articles by regime spokesmen warn of “dangerous consequences” and threaten a crackdown. Beijing’s sledgehammer approach is encapsulated in an unprecedented white paper on Hong Kong’s status, published on June 10, which amounts to a declaration of war upon the democracy movement. The white paper stresses the limits of Hong Kong’s autonomy and says that Beijing can declare a ‘state of emergency’ (i.e. impose direct rule). Even after ‘7.1’, the most influential sections of China’s state-run media pronounced themselves “unmoved” by the massive turnout, while the puppet Hong Kong government has stepped up repression with mass arrests of demonstrators and criminal charges brought against the organisers of the demonstration. 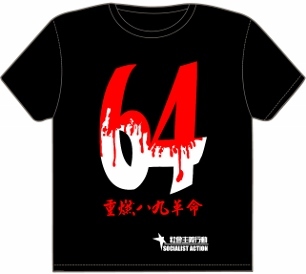 An editorial comment on ‘7.1’ in the Global Times, a CCP mouthpiece, warned that Hong Kong “could sink into the likes of Ukraine or Thailand and all kinds of dangerous phenomenon could happen.” While the Global Times is known for its hawkish positions, this allusion to civil war and military coups is not untypical in the current propaganda war. The Hong Kong police – under political orders – are making a reality of these threats as shown by their aggressive tactics on ‘7.1’ and the following days. 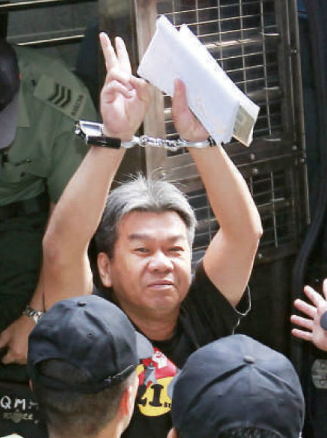 Elected legislator Leung Kwok-hung, known as “long Hair”, jailed for four weeks after a political protest. Growing dissatisfaction with the role of the ‘moderate’ pan democrats is clearly reflected in the published fund-raising results. This is an important feature of every ‘7.1’ demonstration and the main source of funding throughout the year for some of the groups taking part. The ‘moderate’ pan democratic parties all reported lower results than last year, despite the bigger turnout: Civic Party (410,000 HK dollars), Labour Party (180,000), and Democratic Party (200,000). In contrast, the more radical League of Social Democrats (LSD), whose front figure ‘Long Hair’ was serving a 4-week prison sentence and therefore missed the demonstration, raised 930,000 HK dollars, almost 50% more than in 2013. Topping the fund-raising tables was the ‘Occupy Central with Love and Peace’ (OCLP) movement, which raised almost 1.4 million HK dollars. OCLP is seen as the main focus of the struggle in the next period, although politically its leadership is closely allied with the ‘moderate’ pan democrats and their conciliatory position. Sally Tang Mei-ching of Socialist Action (CWI) arrested in the morning of July 2. There is growing impatience and frustration not only with Beijing, but also with the approach of OCLP leaders in holding back the struggle. This pressure was reflected in the decision of student groups to initiate a symbolic ‘trial run’ occupation in Central after the main ‘7.1’ march ended. Their initiative brought a rebuke from the OCLP leaders, with Dr Chan Kin-man saying they hoped no groups would start a ‘trial run’. The OCLP leaders’ position is that the movement must wait until the government’s offer is on the table (later this year). Not only is it already clear that the government will insist on the primacy of its nomination committee, overruling demands for ‘public nomination’ (the right of anyone to stand), but the OCLP leaders’ approach also risks throwing away the movement’s momentum, particularly from the past few weeks, and giving free rein to the government’s campaign of black propaganda and greater repression. The signs from the government compound are clear. Hong Kong police made 511 arrests at the student-led occupation. This is the first time since the handover to Chinese rule in 1997 that so many protesters were arrested at a demonstration. 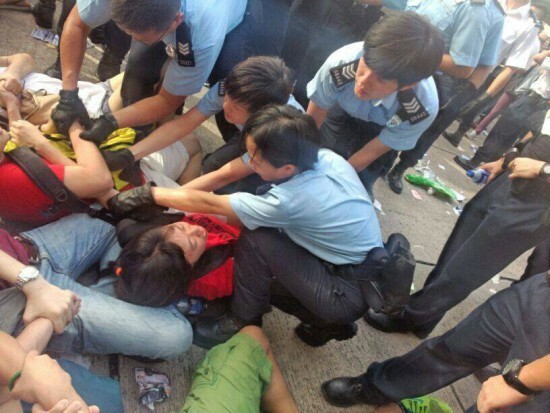 Among those arrested were Sally Tang Mei-ching and Nathan Leung of Socialist Action. The massive police operation and its conspicuously aggressive methods were designed to send a political message. Police admitted using ‘pressure point tactics’ to induce numbness in demonstrators – who were sitting and non-violent – prior to lifting them away. Police loudspeakers repeatedly warned journalists to leave the area in an overt attack on press freedom, which is itself a huge issue in Hong Kong following recent government attempts to shackle the media. Lawyers also complained they were refused access to the arrested, in violation of the law. Most of those arrested were released with a warning, meaning that charges (“unlawful assembly” and “obstruction”) could be filed later at the discretion of the police. 25 were released on bail. Again, however, the government-police tactics have backfired, with the student-led trial occupation gaining big sympathy within society, thus upping the pressure on OCLP leaders to end their policy of prevarication. The Hong Kong government and capitalist elite, under Beijing’s prodding, is therefore preparing for the intensification of the democracy struggle by discarding the velvet glove and baring the iron fist. The regime’s strategy is to step up the pressure on the ‘moderate’ pan democrats and the leaders of the OCLP movement, accusing them of fomenting “violence” and “chaos” in order to bring about a split. By breaking away a section of these leaders in support of a ‘deal’ with the government – which can only be on Beijing’s terms – they hope to throw the movement into disarray and sap its momentum. Socialist Action (CWI) team prepare for the July 1 mass demonstration. Socialist Action has engaged actively in the Occupy Central movement since its launch nearly 18 months ago, just as it is active in the wider democracy struggle. While fighting for every democratic advance, even partial reforms, Socialist Action also criticises the limited compromise-based strategy and programme of the pan democratic leadership. To succeed, the democracy struggle needs a class struggle approach, to link democratic demands with the need to eradicate capitalism and its disastrous social effects. Hong Kong’s struggle for democracy can also only succeed by linking up with mass struggle in China, especially the awakening giant of Chinese labour. April this year saw the biggest factory workers’ strike for 30 years. 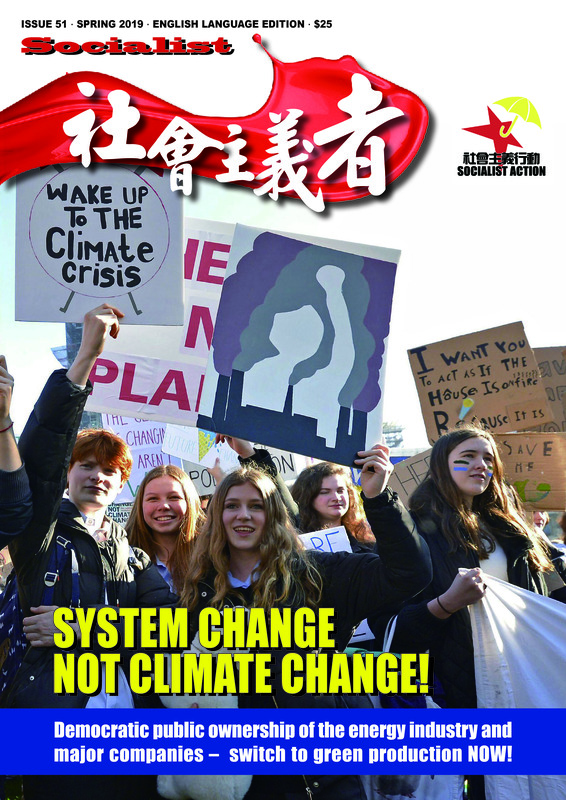 Socialist Action stresses that occupation, while a good platform from which to launch mass struggle and build a movement, cannot by itself defeat the Chinese dictatorship. A strategy is needed to escalate to more effective methods, including student strikes as seen in Taiwan’s ‘sunflower’ protest movement, as a spur to workers to organise and build for strike action. This is especially important given the likelihood that state repression – initially using fanatical pro-Beijing ‘volunteer’ groups – will be used in an attempt to break up an occupation. The decision of the Occupy Central leaders (taken without real democratic discussion) to rename the campaign “… with Love and Peace,” unfortunately shows a head-in-the-sand attitude to what is a crucial question for the struggle. It is rather the “Hate and War” message from Beijing and the Hong Kong government, of a potentially massive resort to repression – including the possible use of Chinese (PLA) troops – that needs to be addressed! An upcoming article on chinaworker.info will look at how the democracy struggle can go forward, examining the programme of the main pan democratic forces, the threat of a crackdown, and the potential for social and political unrest in China.